True “plant geeks” understand soil and plant nutrition in technical, scientific terms. You don’t have to be able to define field capacity, cation exchange capacity or soil ions to be a successful gardener. You should, however, know that soil is more than just dirt. Understanding three commonly used gardening terms – texture, structure, and tilth – should help clear up one of the dirtier mysteries of gardening. Texture, structure and tilth are important because they influence the amount of air and water available to plants. Healthy soil contains almost equal parts of sand, silt and clay, the three main components of soil. These tiny fragments of rock or minerals make up nearly half the material in the soil. The other half is air, water and a bit of organic material. Let’s start with soil texture. The texture refers to the relative percentage of sand, silt and clay. When these three are proportionate, the soil is said to be “loamy”. 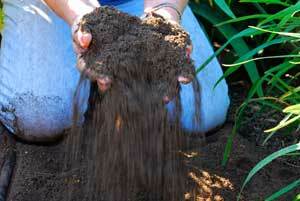 Soil that is considered loamy is generally the best type for the garden. Next is soil structure. Structure is the shape that the soil takes based on its physical and chemical properties. Simply put, structure is how sand, silt and clay fit together. Good structure is evident when the soil holds together if squeezed, but breaks apart or crumbles easily when disturbed. When a soil has good tilth, it drains well. It is loose enough to allow for adequate drainage, yet dense enough to retain moisture long enough for plant roots to utilize it. This is why garden soil should neither contain too much sand or clay. Regardless of your soil texture, structure, or tilth, you can change what you already have. Call it a soil makeover. By adding organic material like compost, humus, manure, leaf mulch, peat moss, etc. you can greatly improve your soil. The key is to know from which extreme you are starting. If a soil is too dense, then your action is to loosen it up by adding gritty organic material like composted bark. For soils that are too loose, you want to increase the water holding capacity. Sphagnum peat moss is a good amendment for this. However, in either case, organic material continues to break down over time. Monitor your soil constantly, and amend often. An understanding of what makes perfect soil will get you well on your way to having the best garden ever.